When the color pooling craze first came around, I couldn’t quite wrap my head around all the excitement. Sure, the argyle pattern is neat, and it’s fun to do something different with a variegated yarn…..but it just didn’t seem worth learning just so I could make a simple scarf to me. If I was going to put so much time into learning a new technique, it was going to have to be for something better than a scarf (I do like scarves….I just don’t particularly enjoy making them.). Then one night during the inevitable Midnight bathroom visit, this adorable little slouch hat, featuring a fun color-work section, popped into my head. In fact, it kept me awake for a few hours! And suddenly…..I was “hooked” on color pooling! It’s SO addictive too! 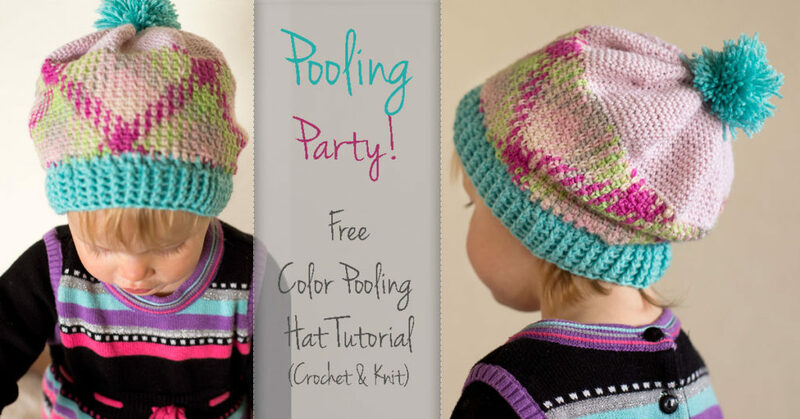 The Pooling Party Slouch Hat is my new favorite hat for my daughter. It’s a fun, and happy hat, and has a really nice fit with the ribbed brim and slouchy style. 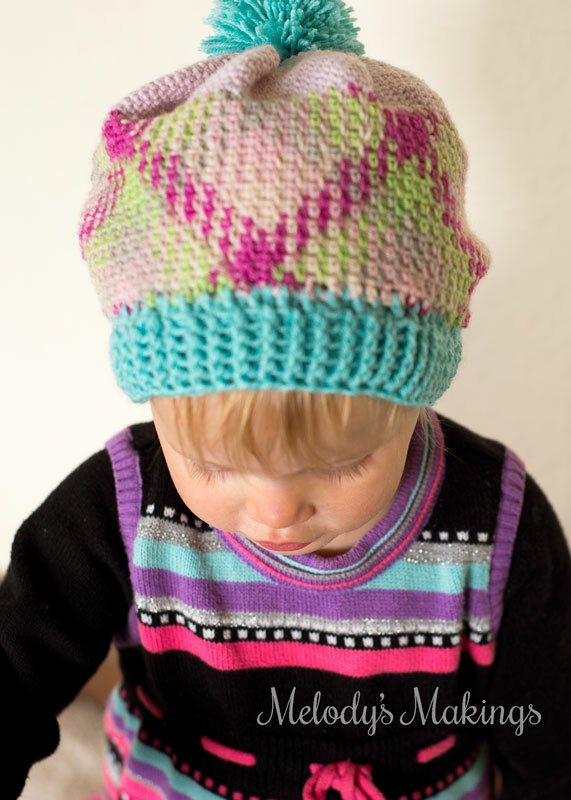 Even better – if you pick the right yarn colors, this hat would be super cute for boys too! My goal when creating this tutorial pattern was to give you all the tools you need to get beyond simple scarves with your color pooling. There are so many more things you can do once you understand the basics and add a little math into the mix. Don’t worry! Yes – you’ll be required to plug your own numbers into the equation to get the sizing right (you can make this in ANY size!) BUT I’ve included all the equations you might need and step by step instructions for doing that. Though the sample shown in my photos is crochet, I’ve also written up a knit version featuring the raspberry stitch for the pooling section. You’ll be working a bit blind since I haven’t had time to create my own sample, however, they’re written to look nearly the same just with a different texture in the pooling section. If you’ve never successfully done color pooling in the past, I recommend checking out this blog post by Glamour4You for crochet, or this blog post I made for knit. There’s a very basic concept behind color pooling, and once it clicks, the rest is easy! I’ve also created a Color Pooling Cheats video for crochet color pooling that might help you trouble shoot through some of the issues I’ve seen people come across in the past. I hope you enjoy creating this cute hat as much as I did! Thank you so much for this fantastic pattern. I have never tried Pooling but I am so excited to give it a go. Running out to purchase the yarn on Monday. am I the only one that can’t get this pattern…everytime I go to Ravelry it gets me back to this page…please help! I’ve wanted to try this technique so i’ll give it a try. Thankyou for the pattern and tips. Please input your information into the form, and you’ll receive an email within a couple of hours 🙂 If you don’t see it in your inbox, then please email me at melody@melodys-makings.com. Thanks! Thank you sooooo much! 🙂 I can hardly wait to get started! 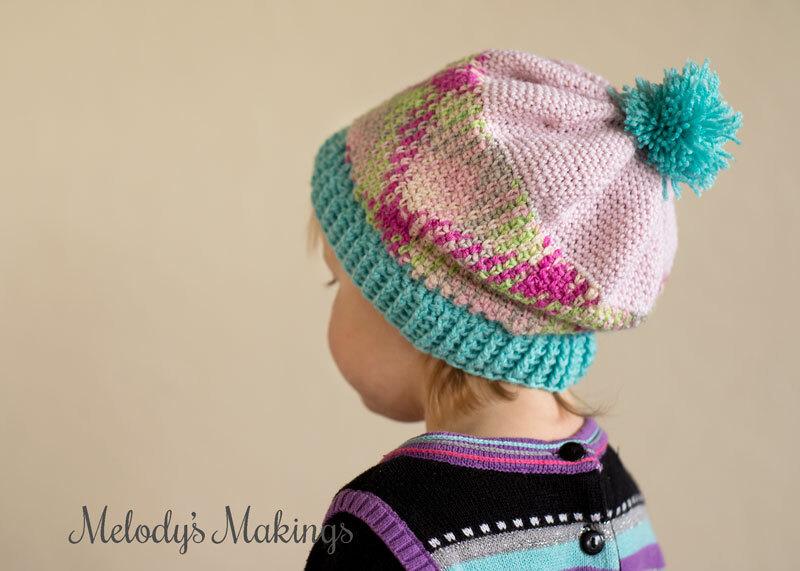 Thank you sooooo much for the Pooling Party slouch hat pattern! 🙂 I can hardly wait to get started! Love to make your hat & pass it along. Will this size fit an adult?